THE PICKIEST EATER IN THE WORLD: THE TENTH BITE: SALVATORE CUOMO AND BAR, NOW IN MANILA! THE TENTH BITE: SALVATORE CUOMO AND BAR, NOW IN MANILA! Even though I've been a food blogger for more than 6 years now, It's still not every day I get to meete a celebrity chef in the international scene. I was ecstatic when I found out that THE Chef Salvatore Cuomo, the man behind Salvatore Cuomo and Bar was visiting the country to oversee the opening of the latest branch of his Italian restaurant empire that has taken Japan by storm. 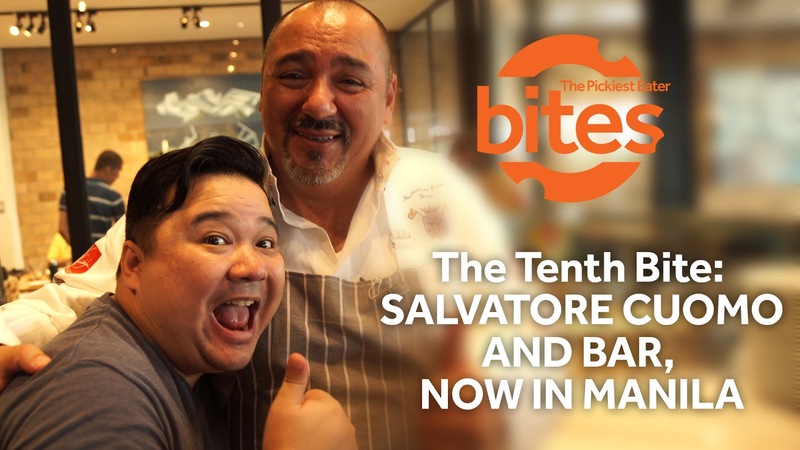 The Pickiest Eater in The World and Muvo Media presents, The Tenth Bite: Salvatore Cuomo and Bar, Now in Manila! Salvatore Cuomo and Bar opened it's first branch in the country at BGC Uptown Parade just a little over a month ago, and Pinoys can't seem to get enough of this fresh, yet at the same time classic take on Italian Cuisine. Here's what I thought of the dishes that was featured in the video! I can't think of a better way to start your meal than with the Tagliere di Affettati (P960). This is an platter of assorted Fresh meats, such as Parma Ham, Neapolitan Salami & Mortadella Ham. I honestly was wary of trying the D.O.C (Denominazione Origine di Controllata, P820) because of the tomatoes, however my blogger friends raved about it. It's made with generous helpings of Mozzarella, Cherry Tomato, Basil. The delectable simplicity of the Quattro Formaggi (P750) must not be missed. Easily one of the best I've ever had in my life, this blend of Four different kinds of Cheeses melds perfectly with the side of honey it comes with, on a perfectly baked crust. The Porcini e Porchetta (P720) was nothing short of spectacular. Made with Porcini Mushrooms, and slices of masterfully Roasted Pork, then topped with Basil, and gooey Mozzarella cheese, I almost think Chef Salvatore made this specifically for me! In my opinion, the Tagliata di Manzo (P1,500) is one of the best value for money steaks you'll find in Metro Manila. It's a glorious Ribeye Steak, served with a side Basil Sauce and Parmesan Cheese. I have no doubt that the Tiramisu served with Pistachio Gelato will blow your mind. The Gelato, which is made in house, was nothing short of amazing. The Torta Caprese (Chocolate Cake) is something that lovers of Dark Chocolate, such as wife Rina, would absolutely go crazy over. Salvatore Cuomo and Bar's menu is a bit on the higher side, no doubt. However you will see what you're paying for in the quality of the food that you are served, in the first rate service, and the enjoyable ambiance! It was an honor to meet Chef Salvatore himself, and even get pizza making lessons from him! Like Salvatore Cuomo on Facebook!